Ministers responsible for the environment from Brunei Darussalam, Indonesia, Malaysia, Singapore, and Thailand met on the occasion of the Eighteenth Meeting of the Sub-Regional Ministerial Steering Committee (MSC) on Transboundary Haze Pollution on 4 May 2016 in Singapore. The Ministers noted the ASEAN Specialised Meteorological Centre’s (ASMC’s) forecast that dry weather conditions are expected for Sumatra and Kalimantan between June and early October 2016. With the El Niño expected to return to Neutral conditions by mid-2016 and with a chance of La Niña developing in the third quarter of 2016, normal to above normal rainfall can be expected for the region during the season. Nevertheless, the MSC countries pledged to remain vigilant and continuously monitor and step up their haze preventive efforts to minimise any possible occurrence of transboundary smoke haze from land and forest fires in anticipation of the drier weather in the coming months. The Ministers emphasised that sustained and long-term efforts to prevent land and forest fires were also critical to address the overarching challenge of climate change. The Ministers expressed appreciation for the substantive efforts by Indonesia in implementing its Plan of Action (PoA) in Dealing with Transboundary Haze Pollution, which included among other things the close and continuous monitoring of hotspots, and enhanced coordination among local governments, the national and regional governments, the private sector and local communities to prevent and suppress land and forest fires. 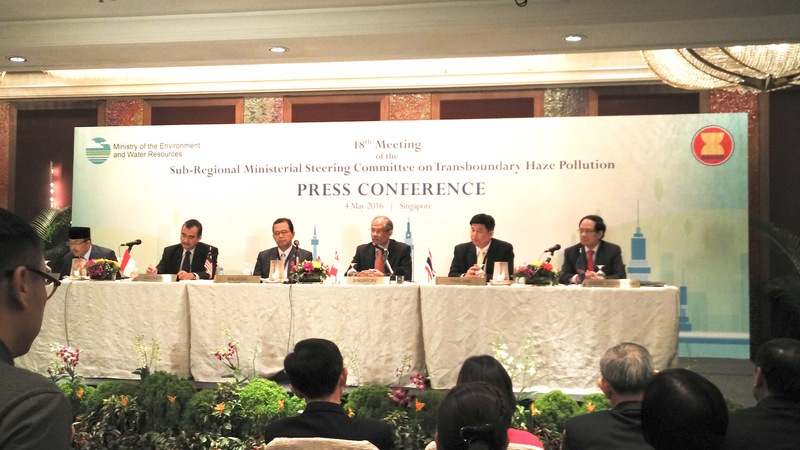 The Ministers also noted the actions taken by other MSC countries to address transboundary haze pollution, including Singapore’s update on the actions taken against errant companies under its Transboundary Haze Pollution Act. The MSC countries also reaffirmed their offer of assistance to Indonesia for emergency response when necessary and called for enhanced cooperation and coordination to ensure the timely and effective deployment of international resources for firefighting assistance. The Ministers provided further guidance on the implementation of the Strategic Review of the Sub-Regional Ministerial Steering Committee (MSC) Programmes and Activities, which involves enhancing haze control management through early warning and monitoring, fire prevention and suppression; refinement of the Fire Danger Rating System; operationalisation of Alert Levels and Trigger Points for immediate and expeditious fire prevention and suppression by including them in the existing ASEAN SOP for Monitoring, Assessment and Joint Emergency Response; and to build up the capabilities of ASEAN Member States under the Regional Haze Training Network. The Ministers welcomed the upcoming Train-the-Trainer Workshop to Implement the ASEAN Guidelines on Peatland Fire Management that Indonesia and Singapore would co-host in Pontianak, West Kalimantan from 30 May to 1 June 2016. The Ministers reaffirmed the commitment to effectively implement the ASEAN Agreement on Transboundary Haze Pollution to prevent and monitor transboundary haze pollution from land and forest fires through concerted national efforts and regional and international cooperation, including legislative, administrative and other relevant measures, and prompt response to requests for relevant information or consultations sought by ASEAN Member States. On bilateral cooperation, Indonesia, Malaysia and Singapore are willing to continue their cooperation in the spirit of the ASEAN Agreement on Transboundary Haze Pollution on a Government-to-Government basis, building upon the previous experiences. The Ministers recalled that the Leaders at the 27th ASEAN Summit held in Kuala Lumpur on 21 November 2015 had noted the initiatives by the MSC countries and encouraged them to take the necessary actions in order to operationalise the ASEAN Sub-Regional Haze Monitoring System (HMS). The Ministers also noted the continuing difficulties in sharing land use and concession maps by the MSC countries and agreed that in the meantime, the MSC countries continue to share information on a Government-to-Government basis on hotspot areas that gave rise to transboundary haze. The Ministers noted the discussions of the 6th Meeting of the MSC Technical Task Force (MTTF) in October 2015 on developing a set of guidelines for information exchange, and noted that Brunei Darussalam, Indonesia, Malaysia, Singapore and Thailand had agreed to share the details of hotspot information as specified in the ASEAN Standard Operating Procedure for Monitoring, Assessment and Joint Emergency Response. The Ministers tasked the MTTF to further work on the modality for sharing the hotspot information among MSC countries and the MSC countries to continue working towards operationalising the HMS. The Ministers recognised that it is timely for a regional study to be conducted on the economic, health and social impact of haze in 2015 on the ASEAN region. This study is crucial for ASEAN to assess the implication of the 2015 haze incident and enable countries to have a baseline economic, health and social data to understand the impact of transboundary haze. The Ministers agreed to task the ASEAN Secretariat to collate the necessary information initially from MSC countries in accordance with their national laws and regulations. The Ministers noted the intention and steps taken by Indonesia to host the ASEAN Coordinating Centre for Transboundary Haze Pollution Control (ACC), including the Workshop on the Preparation for the Establishment of the ACC that was hosted by Indonesia on 28 April 2016 in Jakarta. The Ministers looked forward to faster and more effective implementation of all aspects of the ASEAN Agreement on Transboundary Haze Pollution after the ACC is operational. The Ministers noted the substantive progress of the development of the ASEAN Programme on Sustainable Management of Peatland Ecosystems 2014-2020 (APSMPE), and the encouraging response and support from ASEAN dialogue and development partners. The Ministers renewed their commitment to implement this regional Programme through ASEAN mechanisms, enhanced national level efforts and multi-stakeholder partnership. The Ministers noted the progress of the development of the Roadmap on ASEAN Cooperation towards Transboundary Haze Pollution Control with Means of Implementation, from the 1st Task Force Meeting to draft the Roadmap that was hosted by Thailand in Chiang Mai on 7-9 March 2016. The Ministers looked forward to the adoption of the Roadmap by the Conference of the Parties to the ASEAN Agreement on Transboundary Haze Pollution in August 2016 for notation by the ASEAN Leaders that would guide ASEAN Member States towards achieving the vision of a Haze-Free ASEAN by 2020. The Ministers expressed their appreciation to the Government of Singapore for organising the 18th MSC Meeting and the excellent arrangements made and hospitality provided.